G-CAS! Sew Excited! : WTW!!! A Blog Post? Where have I been? Reading everyone else's Blogs and living life! WTW! I have come out of BLOG retirement for errrrr uuuuum uuuuuh I dunno, We'll see! Anyhooooo, I entered a contest on Pattern Review! The last contest I entered was back in 2009 and I won a prize! It was a knit challenge and I made a dress. Well this contest I'm in is a mini wardrobe A match B match C ext. I made myself a little wardrobe for work because the Fabu Terri of Virginia's Sew Blessed Daughter put us all to shame and made a smokin 80,000 piece wardrobe and won the PR Contest to boot (OK, maybe not 80,000 pieces, but close) and because I needed some business casual clothes. So, I stopped my current project to check to see if the pattern was reviewed on PR and I saw the Contest Link. I usually check it out and cast my vote. Low and behold there was a contest I was actually eligible for and was done sewing! After the loooong entry process (no it's spelled correctly), it felt crazy to not add the "blog" link. I'm not going back to add it so errrr uuuuh anyway. Yeah. I made 5 pieces and I'm adding Pics! Work has slowed down a tad so I'm binge sewing and blogging (today). I even cooked dinner and did "some" laundry. This is my entry photo! Just the shirt. It's so soft! Thanks Tajmah! Not to bright for you?! LOL! Hahaha! Carol...you are too funny!!! Love these pieces. Saw a close-up of the top on instagram...instant love! 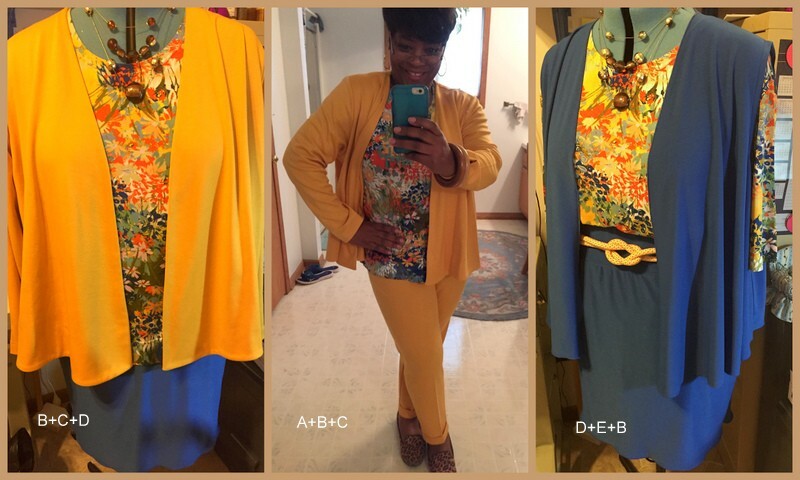 Great coordination of pieces and colors! You've got my vote!!! WERK! Thanks Terri! I bow down to you Wardrobe Master!! It's a gorgeous mini wardrobe Carol! Awwww shucks Ms. Faye! Thanks! Thanks so much M and M plus 3!!! Periscope - Another Social Media App? !